Scientists from the University of California in San Francisco have reported that they successfully hacked living cells to make them fold into different, sometimes complex, shapes. However, what’s most exciting, is that they managed to get the cells to morph into different shapes by entirely natural processes (except for the hacking part, that is). Basically, the researchers laid out cells in ways that they naturally apply a force on other cells’ extracellular fibres. Scientists were able to create shapes ranging from cubes to coils, demonstrating that the cells could theoretically be morphed into any shape desired. However, there’s more work to be done before commercial or medical applications for this are found. 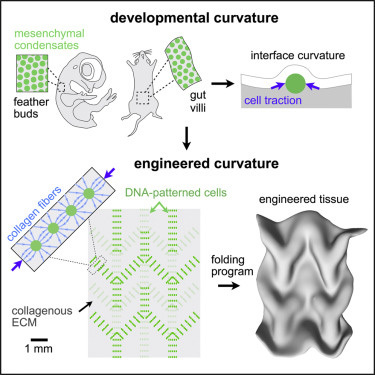 For starters, the scientists want to combine their research with other developments being made in the field of tissue-patterning. They also are yet to understand the changes cells experience due to the process that actually makes them fold into such pre-specified patterns. Those answers are for a later time, though. Considering what the researchers have been able to accomplish with living cells, the practical use-cases are many. Scientists could use the technique to literally manufacture organs designed specifically to a particular shape and size. The same method could also be used in building robots with live tissue, instead of artificial substances like rubber. Basically, researchers have brought humanity one step closer to being able to manufacture organs, and build robots that actually grow with time. The robot thing may sound creepy (it probably is, we’ll have to wait and see), but the potential for this tech is certainly far-reaching.